We waited patiently outside the humble entrance to Trattoria di Oscar. It was our final night in Monterosso as well as our last in the Cinque Terre. A tiny, gorgeous stretch of Ligurian coastline, Cinque Terre is made up of five candy-colored villages built right into the rocky cliffs: Monterosso al Mare, Vernazza, Corniglia, Manarola, and Riomaggiore. Five villages linked by four hiking trails, one train and the occasional boat. After a terrible lunch in Corniglia (lured by a sunny piazza we chose a place that somehow managed to make gnocci inedible), I wanted this dinner to count. Blink and you’ll miss it. 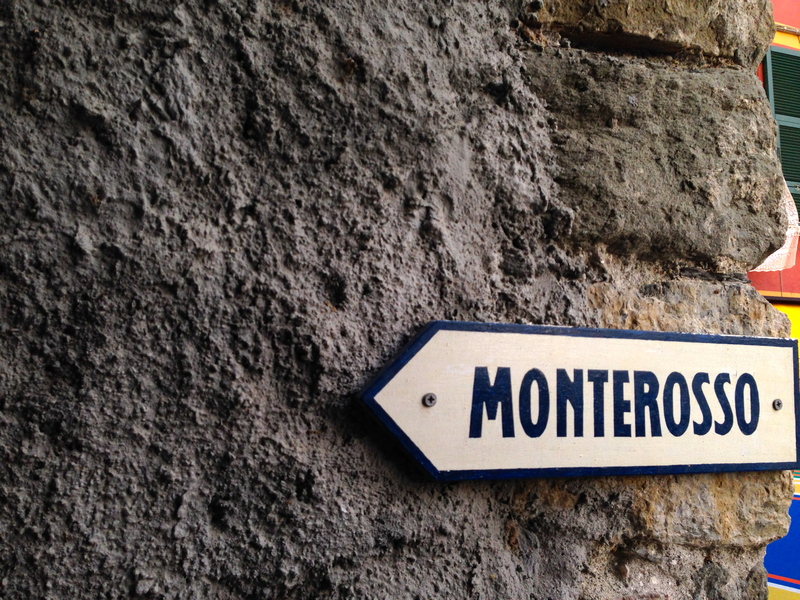 The sign leading the way back toward Monterosso. With the warmth of the sun several hours gone, there was no mistaking the brisk chill hanging in the air. I thought the more humble we looked, the more deserving we’d seem to be for one of the few inside seats. Some unlucky couples sat outside, bundled up and bearing the cold, but I didn’t want to be one of them. There was just one woman working, tall and slender with a cool, androgynous style. She moved with necessary precision. Each trip outside was a calculated mission. She delivered drinks here, took an order there, while clearing a table in between. Interrupting this rhythm seemed impossible, until she finally made eye contact with Peter. In his adorably garbled Italiano-English he sealed the deal. A table would be ready in an hour. “Inside?” He asked as politely as could be. “Yes, inside.” And then she rushed off. When you step inside Trattoria da Oscar, you suddenly feel like you’re in a cove under the sea. It is dark. The room is small, no more than 8 tables, with a curved, textured, cave-like ceiling. It’s all white and gray with a luminescent glow, the kind of lighting that heightens the sexiness of everything. There’s an extra sparkle in your glass of white wine… and in the eyes of the person sitting across from you. This under-the-sea effect isn’t apparent from the outside, making it all the more enchanting once you walk inside. Yet Oscar is not overly sleek. It’s not the kind of place where you’re presented with a beautiful plate of food, with no clue who made it or where it came from. A working kitchen takes up a third of the room. There is a man, a kinetic equal to the woman outside, who is clearly cooking your dinner—and creating an intoxicating alchemy of scents in the doing. So it doesn’t just feel like you’re in an oceanic wonderland, it smells like one too. It doesn’t just feel like you’re in an oceanic wonderland, it smells like one too. Peter and I sat at a table closest to the kitchen, with just a counter and a low set of stainless steel shelves dividing us from the action. Elvis Presley crooned from the speakers. We ordered a bottle of local wine—Sassarini Bianco—and I sat back against the sea floor wall and listened as Peter described what was happening in the kitchen. It was almost like our own private episode of Iron Chef. This delicious ballet—from order to production to plating to service—was mesmerizing to watch. I wish I could tell you that the cook was named Oscar. And that the woman working was his wife. But I don’t know. I didn’t ask them. I just know that they seemed like a team in every sense of the word, and their restaurant felt alive and breathing because of it. But what I really want to tell you about are the anchovies. We ordered Anchovies Three Ways (acciughe tre modi). Let me tell you, I am not typically an anchovy kind of girl. To be honest, I would have been happy with the calamari as an appetizer. I knew I’d enjoy it, but it would have been lazy ordering. Cinque Terre is an anchovy kind of town, so when in Rome, etc…? You get the anchovies. Oh my god, I am so glad we did. The woman delivered a plate that looked like modern art, pointing at each section quickly, “Salty, white wine and pickled.” She may have given us a quick smile. Then she was off. The Salty anchovies were filleted and flash fried with oregano and capers scattered across them. I never realized how many expressions of salt there could be. One bite was like an atomic bomb of saltiness—the brash taste radiating across my tongue in so many different shades, the anchovy may as well have been dancing a Merengue in my mouth. The White Wine anchovies were cooked whole, presumably braised in white wine, parsley and other herbs. Both Peter and I had a different revelation here—the anchovies were so meaty, they tasted like tender white fish with none of the saltiness of the previous version. The Pickled anchovies were my favorite. I had no idea I would ever fall in love with a plate of picked anchovies! But the little fillets were the perfect balance of sweet and sour, with a salad of spinach and red onion to cut the tartness. The anchovies eaten together is where the magic happened. It felt like a literal magic trick—how did they take the same tiny fish and create such utterly different flavors with it? While alternating bites between the salty, the pickled and the braised white wine anchovy, my taste buds could barely keep pace with each change in flavor. My tongue tingled long after the plate was cleared from our table. It felt like a literal magic trick—how did they take the same tiny fish and create such utterly different flavors with it? After the first course the stereo switched from Elvis to Sinatra. “The Best is Yet to Come” started playing. This song is unabashedly my favorite Sinatra tune. Ever the optimist, I enjoy hearing it under any circumstance, but this night it felt very specific. Was the best yet to come that night during dinner? During our time in Italy? Or during our marriage? That night at Trattoria da Oscar we realized that this very weekend in October matched the weekend twelve years ago when we first started dating. This weekend jaunt to Cinque Terre became an inadvertent anniversary celebration. Maybe that’s why I remember this dinner so fondly. Maybe that’s why it’s what I hope to remember most clearly many years from now. For our main course we had the Spaghetti con Fruta di Mare (poetically put—fruit of the sea). The dish is for a minimum of two people and we soon found out why when the woman set down a steaming hot braising dish, at least a foot across, on our table. Inside was a mountain of pasta, clams, mussels and shrimp in an herby tomato sauce. This is the moment when your stomach somehow finds the necessary room. We helped ourselves to what seemed like a generous amount, but there was still so much left. As we slowly made our way through the dish, plucking a mussel here, peeling a shrimp there, I noticed an Italian couple sitting next to us. They were in their 40’s and looked to be locals—it was ten o’clock and they were just sitting down to dinner, so you know they weren’t tourists. When we were about halfway through with our pasta, the woman brought an identical braising dish full of spaghetti over to their table. Not speaking, and barely making eye contact, they both served themselves massive portions and just went to TOWN. The woman picked out each and every bit of seafood like an assassin. Her bare hands were her weapon of choice. Once the bowl for discarded shells was full, she got down to business. I could spend a decade living by the sea and still not have the chops to eat like her. There was no dessert, sadly. Trattoria da Oscar had the most whimsical looking house-made tiramisu, but they were out by the time we finished dinner. It was served in a little glass jar with a hinged lid, ladyfingers daintily layered upright along the side of the jar. It’s a dessert to be replicated at home, I suppose. Oh, and the wine…. The wine was so good. As I mentioned, we had a bottle of Sassarini Bianco—just their house white. It’s produced in Cinque Terre, so naturally it compliments the seafood that is so plentiful there. I remember a bright, flinty taste, a dance across my tongue that lingered just a little. Something just a little sweet to wash the salt away. Your description of everything in such fine detail is exquisite. It makes the reader part of the experience with you – and makes me want to go there myself! Can’t wait for your next blog! PS: Can I request that you find — and then write about — the best cacio e pepe in Rome?